Steve Jobs and phone hacking: Exploding the Phone by Phil Lapsley, reviewed. Before Steve Jobs and Steve Wozniak invented Apple, they hacked phones. 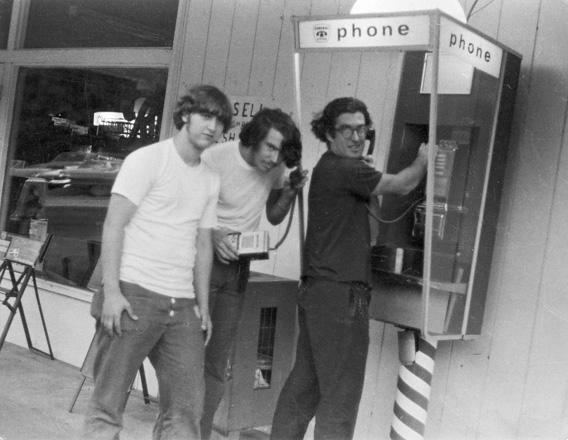 Phreakers Bob Gudgel, Jay Dee Pritchard, and John “Captain Crunch” Draper, 1971. From Exploding the Phone. Photo courtesy of Bob Gudgel. 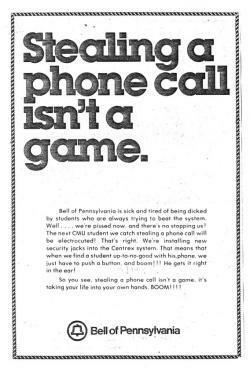 A joke ad posted, possibly by the Bell of Pennsylvania security department, at Carnegie Mellon. From Exploding the Phone. Like Tufte, Jobs and Wozniak, amazingly, were never busted—though they came close. In one of the most action-packed sequences of the book, Lapsley details a run-in with the law that almost landed the pair in jail in the early 1970s. On a drive from Berkeley to Jobs’ house in Los Altos, Jobs’ car broke down. Wozniak and Jobs walked to a nearby gas station and attempted to use one of their blue boxes to call Captain Crunch—who was by then a friend—for help. The calls didn’t work. Cops turned up and questioned them about the blue box. Wozniak managed to convince an officer that the blue box was a synthesizer, even playing a few tones to demo the device. Incredibly, the cop bought the whole story, letting them go—they even got their blue box back. Many other phone phreaks were not so lucky. Several of them served prison sentences; many paid exorbitant fines. Phone phreaking still exists today in some quarters, but is, for the most part, an anachronism, supplanted by the rapid growth of computer hacking. But there was still something magical about hacking phones, and the stories are legend to this day. Exults Jobs in a 1998 interview, quoted in Exploding the Phone: “It was the magic of the fact that two teenagers could build this box for $100 worth of parts and control hundreds of billions of dollars of infrastructure in the entire telephone network of the whole world.” You can spot Jobs’ all-consuming ambition, creative vision, and penchant for total control in his happy-go-lucky days of phone phreaking in the ’70s. Exploding the Phone is Rosenbaum’s Esquire article writ large over 400 densely packed pages. Lapsley lacks Rosenbaum’s flair for language, but he makes up for it with technical depth and an obsessive amount of research. In addition to conducting numerous primary interviews, Lapsley filed over 400 freedom of information requests with the FBI, DOJ, CIA, NSA, FCC, and the National Archives while writing the book. Intriguing details culled from thousands of pages of government records, most notably the FBI files on various phone phreaks, fill the book’s pages. But that discomfort is often a sign that those curious people are on the right track. “If we hadn’t made blue boxes,” Steve Jobs said in 1998, “there would have been no Apple.” After all, as Lapsley points out, most of the phone phreaks didn’t care about making free long-distance calls. It was burning curiosity that motivated them. “There is a societal benefit,” he writes, “to tolerating, perhaps even nurturing … the crazy ones—the misfits, the rebels, the troublemakers, the round pegs in the square holes.” Sometimes those curious misfits turn out to be Steve Jobs, Steve Wozniak, Edward Tufte—or Aaron Swartz. See the toy whistles phone phreakers used to hack Ma Bell on the Vault. Exploding the Phone: The Untold Story of the Teenagers and Outlaws Who Hacked Ma Bell by Phil Lapsley. Grove Press.